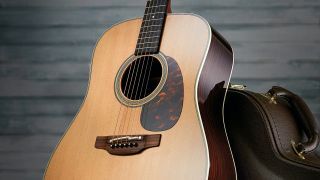 Takamine had a mountain to climb when it set out to challenge the dominance of American acoustic makers in the 1960s - but the Japanese company soon became master of the electro-acoustic format, relied upon by everyone from Bruce Springsteen to the Eagles and justly earning the title of the ‘hardest-working guitars in music’. When you think of manufacturing in Japan, perhaps the first images that come to mind are bleeding-edge technology and robot-served production lines. But while Honda, Sony, Nikon and other mega-brands may define the state of the art in high-tech gear, there’s another side to the story. Hand-built craftsmanship is at the heart of Japanese culture and that hasn’t gone away. In fact, the artisan culture that grew to fruition in centuries past still guides the way musical instruments are made in Japan - even if you might not think it at first glance. We’re musing on this as our bus carries us high into the green hills near Sakashita, where Takamine is based. Takamine has made a huge success in carving out a niche as a brand that makes incredibly dependable stage guitars used by everyone from Pete Townshend to the Eagles. But while this is testament to the road-worthy quality of the guitars Takamine makes, it is also a kind of typecasting that somehow implies that the guitars are workhorses rather than thoroughbreds, built on a production line rather than crafted by hand. As we were about to discover, that’s not the case - but, in a very Japanese way, Takamine doesn’t choose to boast about it very often. Today, however, the company has opened its doors to us so we can see how things are done the Takamine way. Our host is Mr Makoto Terasaki, the company’s man for all seasons. Makoto oversees design for everything from the guitars themselves to the ever-dependable electronics such as the CTP-1 Cool Tube preamp, which provides warm amplified tone from onboard pickups through the clever implementation of a 12AU7 valve in the preamp. It’s just one example of the holistic approach Takamine takes - in which all aspects of design are kept in-house wherever possible. Once we’ve passed through the gleaming wood-panelled foyer of the factory, where many of Takamine’s most impressive exhibition-grade custom guitars are displayed, we enter the almost medically tidy factory plant, walking first through the wood room, where tonewoods used for tops, necks and fingerboards and so on are stored. In passing, Makoto says that although the company has produced instruments utilising torrefied or roasted woods, notably in its Thermal Top Technology guitars of 2017, the company has now reverted to conventionally seasoned tonewoods again. Overly aggressive torrefaction processes can result in brittle wood, and while many makers (including Takamine) developed ways to mitigate that successfully, you get a sense that Takamine takes a zero-tolerance approach to any potential risks to the player’s longterm satisfaction, no matter how marginal those risks might be. Emerging at the other end of the wood room, we find a craftsman making spruce tops using hide glue and iron-shaped weights to join the two flat sections of spruce together. It’s about as traditional an approach as you can get - and instantly dispels any idea that Takamine’s guitars are made in a faceless, production-line environment. The craftsman moves rapidly between around a dozen tops, gluing, checking, weighting each carefully while the hot hide-glue simmers in a copper pot. It’s a scene that wouldn’t look out of place in a 1950s workshop. Moving on, we find another Takamine craftsman shaping the bracing that supports the spruce top with swift, sure strokes of a wickedly sharp chisel. It’s the sort of work that can’t be done hesitantly or tentatively - you have to know how to do it dynamically but accurately, as this man does. However, when it comes to gluing the bracing to the top, a modern vacuum press is used to uniformly apply pressure on the delicate struts of bracing while the glue dries, ensuring a perfect bond. As the tour continues, you can see that both technological and traditional luthiery techniques are employed, each being used where it is the most effective approach. For example, not far from the workstation where a young employee is carefully fitting frets by hammer and eye, there is a laser-calibrated finishing system that levels and crowns each fret to within 0.0001-inch accuracy, augmenting the traditional skills of the fret-fitter with the perfect precision offered by custom-designed technology. Again, we’re struck by the fact that the tension that’s supposed to exist between ‘hand-built character’ and ‘machine-built precision’ doesn’t exist at Takamine. 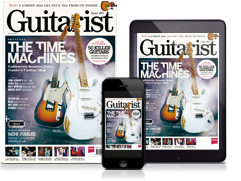 Instead, the guiding principle of ‘make each guitar as good as it can be’ means both approaches are used, as and when they support the ultimate goal of making incredibly reliable, toneful guitars. The year is 1976, and America’s house band are hard at work in Miami’s Criteria Studios, tracking the anthem that will seal their immortality. Upon its release, Hotel California - the title track of the Eagles’ 42-million selling, career-defining album - will be fêted for the duelling outro solo performed by guitarists Don Felder and Joe Walsh. But six minutes before that, the mood is set by Felder’s acoustic 12-string intro, its wistful minor-key jangle perfectly encapsulating the song’s fame-jaded sentiment. To hear just a bar of that intro is to evoke a whole era. Four albums into their career, the Eagles were multi-platinum millionaires, and Felder could have picked any big-name acoustic guitar off the rack for this moment. So it speaks volumes he chose a Japanese brand that had only recently launched into the international market. By the late 70s, Takamine was giving sleepless nights to the big guns of the US guitar industry. But the seed of this revolution was planted almost two decades earlier, in 1959, when a modest family-owned instrument workshop opened in the Japanese town of Sakashita. Three years later, the business adopted the name of the imposing mountain on whose foothills it nestled, and it was a fitting metaphor: in a market dominated by the time-honoured American worthies, from Gibson to Martin, any newcomer faced a steep upward climb. As it turned out, Takamine would do far more than make up the numbers. Perhaps more than any other modern luthier, the Japanese firm blazed a trail for the electro-acoustic artform, while luring a starburst of disparate performers ranging from Bruce Springsteen to Biffy Clyro. Takamine’s ambitions took a little time to reveal themselves, however. By the late 60s, the Japanese firm was chiefly renowned in the domestic market as a builder of fine classical guitars and mandolins, with incoming master craftsman (and future company president) Mass Hirade sparking many of the best designs and tightening up the build processes. Although Hirade’s specialism was in classical guitars, by the decade’s end, Takamine had produced an inaugural run of Martin-style steel-string acoustics. Yet attempts to plant a global footprint had faltered; at one point, a partnership with Martin was on the table, with the Japanese company set to produce the American builder’s entry-level models - but ultimately the deal was nixed by a conflict between distributors. The 70s changed everything, however. In 1975, with US super-distributor Kaman greasing the wheels, Takamine’s striking Sitka spruce dreadnoughts and OMs hung in international music stores for the first time. And with the debut of the PT-007S model in 1979, the firm brushed away any comparison with Far Eastern copycats. By this point, the electro-acoustic concept was hardly new (it had been floated as early as the 1920s), but the PT-007S represented a big leap for the format - and for live musicians struggling with mic’ing and feedback, thanks to Takamine’s new bridge-mounted Palathetic pickup system. Using six king-sized ceramic elements that captured the signal of each string, and bringing all the harmonic richness of the resonating soundboard into play, the result was a feedback-free, plug-and-play guitar whose amplified tone sounded unplugged. That purity of tone under amplification quickly became Takamine’s trump card. “The very first time I played a Takamine was in Nashville,” remembers Dave Stewart of Eurythmics. Into the 80s, it was common to spot Takamine on the world’s biggest stages, with stars like Jackson Browne, Ry Cooder and Steve Lukather all revelling in their new mic-less existence. “Glenn Frey told me,” recalls artist relations manager David Vincent, “how he’d been turned onto Takamine around 1980 by Fred Walecki of Westwood Music in LA. And how prior to that, playing acoustic live meant wrestling with mic feedback or tolerating crappy-sounding soundhole pickups. As the decade rolled on, the firm capitalised on its growing profile. In 1982, electro-acoustic versions of the acclaimed H Series Hirade Concert classical series touched down. In 1986, we welcomed the Natural models, while the following year, the enduring Limited Edition series was born with the EF25: a model whose white-and-gold appointments established the annual tradition for a visual showstopper (try 2004’s ‘Dragon & Bear’ for the most striking example). Takamine proved it could be both pragmatic (with the launch of the affordable G-Series) and playful (with fans of the Gibson Flying V left blissfully baffled by the pronged body of the EA360S - often dubbed the ‘Flying A’). All the while, the Japanese company continued its pursuit of amplified acoustic nirvana, with 1988 seeing the debut of the parametric equalizer (later redesigned as the AAP preamp) that allowed players to dial in their ideal tone. But perhaps the era’s most pivotal development was the 1988 arrival of Makoto Terasaki: the master luthier and creative whirlwind who swept through Takamine with opinions that tweaked the nose of conventional industry wisdom. By the early 90s, with the range sprawling to take in everything from the highly decorative Santa Fe models to thinline composite-backed offerings such as the ST26, Takamine had planted a flag in virtually every sector of the acoustic business - except for the burgeoning signature model market. That all changed in 1990, with the SW341-SC model created for country star Steve Wariner paving the way for a collaboration with a young Garth Brooks, who was then playing a Takamine EN15C, as he broke through with the chart-topping No Fences. Another milestone artist model was born in the post-millennium, as the Eagles association continued with the EF360GF model, created for Glenn Frey and based on the late star’s cherished ‘Number One’ Takamine electro. The EF360GF still sells in the present day - but Takamine is a company on the march. Since the post-millennium, we’ve seen a fistful of new lines including the powerful SuperNatural, the handmade Nashville and the mouth-watering Pro series, built in the foothills of the Japanese Alps. In honour of our visit, Makoto has arranged for an array of the company’s latest acoustic designs to be arranged on stands for us to try. No second invitation is required and we spend a pleasant hour strumming and picking our way through an eclectic selection that is arguably more liberated from convention than the majority of acoustic makers. We especially enjoyed the expansive voice of the PTU041C cutaway jumbo from the company’s large-sized 800 Series. Despite the girthy body, the handling was pleasant and the voicing mellow but clearly defined, meaning even fingerstyle parts sounded good on this poised modern jumbo. But Makoto Terasaki is also keen to reflect trends towards smaller, Americana-focused guitars and that was evident in the vibey slot-headstock DMP471M-DC, made of solid Honduras mahogany. This had more of a 1930s blues, parlour-style voice and retro styling details such as diamond inlays. But, for all that, it’s still a Takamine, which means it’s an electro and features Takamine’s CT4-DX preamp with a four-band EQ, tuner plus notch filters to eliminate feedback. Takamine also revels in making beautiful collector-grade pieces that show off their artistry in hand-inlaid pearl wrought into ornate, often nature-inspired designs. This was reflected in the gorgeous PXM-1, with its wintery-pale German spruce top, solid Jacaranda back and sides and vine-like inlay tumbling down the ebony fretboard. Looking closer, all the edges of the instrument are inlaid with pearl, too, making it a real stunner visually. But for all the flamboyant embellishment, the PXM-1 still had that blend of elegant, slick design and pragmatic function that’s very typical of the company and which Takamine’s giant roster of artists evidently values.